QtitanDataGrid is a commercial DataGrid component for Qt that offers a truly extraordinary possibilities to present tabular data to the end-user. Component absorbed all modern achievements in the area of the user interface construction for displaying tables. At the moment, this is the only grid component on the Qt market with such an impressive array of advanced functions and outstanding performance. This Qt data grid component was created entirely in C++, which had a very positive effect on its speed, especially in cases with large and extra large sets of data. QtitanDataGrid is fully integrated with QtDesigner, so it will seamlessly fit into your familiar development environment and guarantees 100% compliance with the Qt GUI. 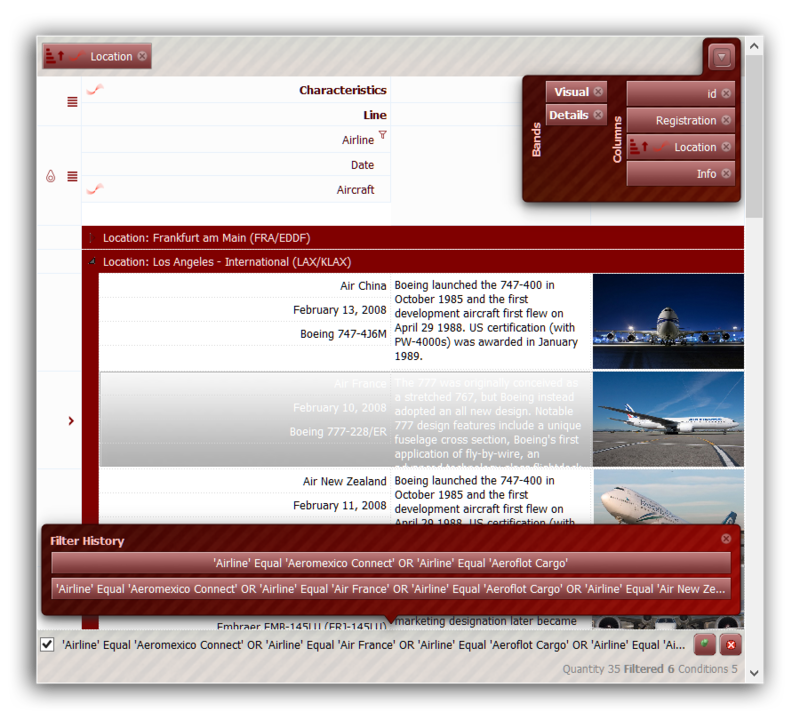 QtitanDataGrid provides a complete set of standard QTableView functions and a wide range of unique features that cannot be implemented using default components and methods. QtitanDataGrid enables you to load various types of data from different sources into a fast, flexible and functional editable grid supporting sorting, grouping, reporting, creation of banded columns, drag’n’drop for buttons and plenty of other handy functions. This data grid helps novice and experienced Qt developers with Delphi and C++ background to use the same comprehensive advanced editable grid capabilities that they’ve grown accustomed to in corresponding IDE’s and that are not part of the standard Qt library. Ultra-fast processing of large data sets loaded into the grid component. Integrated high-performance caching mechanism if your model does not support it. Advanced and optimized paint engine for faster rendering of grid UI elements. Virtual row mode. Allows to display and scroll hundreds of thousands rows with data without lost in performance and memory usage. Two modes of vertical scrolling. By pixel like in the ordinary web browser or by single row. The ability to build complex hierarchical table headers. Combine columns into the logical structures called the Bands. Ability to group data by one or several columns by dragging it to the header of the grid. Like in the Microsoft Outlook. Flexible sorting. Sorting mechanism is built into the grid and does not require QSortFilterProxyModel. Sorting can be done for one or a few columns. To sort by multiple columns, you should hold down the Control key. Lets fix the columns scrolling horizontally at the left or at the right. The same way as MS-Excel does. Lets fix the rows scrolling vertically at the top or bottom of the view. 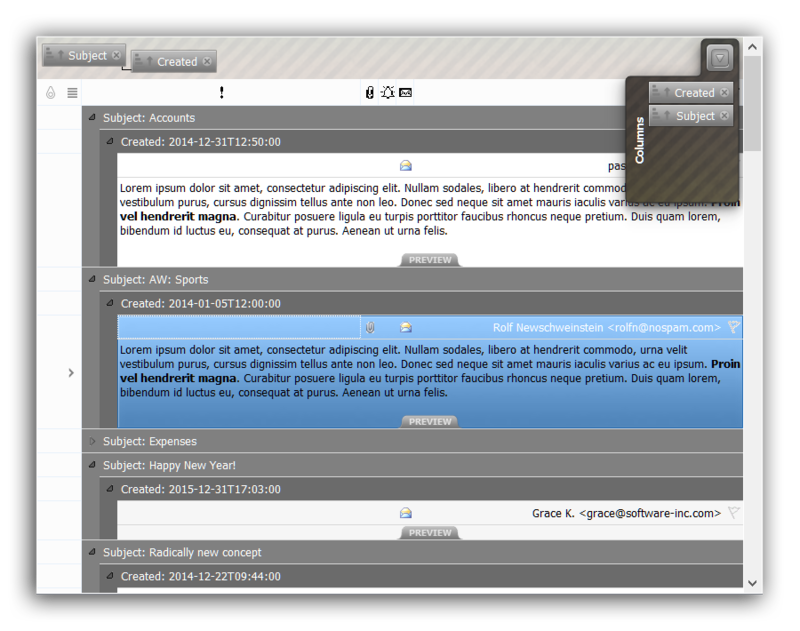 Automatic width and height adjustment for grid's' cell and columns. Cross-platform support. Although the Qt is a cross-platform toolkit, implementation of rich functionality often requires direct access to the platform API that is used. Ability to show summaries for the columns on the footer panel or on the bottom of the group row for the columns that is in the grouping state. Filter support. Supports the ability to set filtering conditions through dialogue or by means of a filter drop-down box that lists all values encountered in the column of the grid for which you want to filter.As well as in the case of the sorting does not require the use of QSortFilterProxyModel. Provides a convenient mechanism for creating custom cell's editors. Supports using delegates from the table - QTableView. Is able to switch to the emulation mode for behavior of the Microsoft Office table parts. Support for zooming. The zoom mechanism is activated by pressing a button Control + "+" (to increase) / Control + "-" (to reduce) or from the popup menu. Use of QStyle for rendering objects ensures that the grid blends into the Qt GUI design of any application. Customizable colors of rows and columns. Ability to decorate any column's header with custom color. Support model-based font and color settings. Integration with QtitanRibbon UI component to full-fit the MS-Office UI Styles. It has a modern look-and-feel and is suitable for use in any type of the business applications. If you want to know more about QtitanDataGrid and the features of this powerful Qt third-party widget, make sure to visit this page. As you see, QtitanDataGrid has everything you need to add a highly flexible, fast and easy to manage grid controls to your application that will perfectly blend into the standard Qt GUI. If you develop Qt programs that process large sets of data and output speed is one of your key priorities, this Qt third-party widget will be an invaluable addition to your developer toolkit!